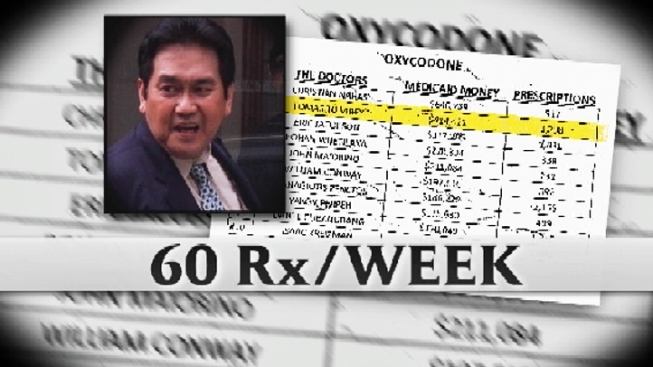 I-Team: Bronx Doc Accused of Running "Pill Mill"
A Bronx doctor who wrote more Oxycodone prescriptions under Medicaid than any other physician in New York state is under fire from neighbors who say his office is a pill mill that caters to drug addicts and dealers. Medicaid records obtained by NBC 4 New York's I-Team show Dr. Tomasito Virey, who practices in Castle Hill, averaged about 60 Oxycodone prescriptions per week in 2011, costing taxpayers a total of $414,421 last year. Virey wrote a total of 3,208 prescriptions for Oxycodone in 2011. That is 48 percent more prescriptions than the next closest physician on the list of top Medicaid prescribers of the powerful opioid drug. The 37-year-old former patient said she became hooked on pain pills after visiting Virey’s practice on Westchester Avenue. When asked as he was walking into his clinic if he had any explanation for the high volume of Oxycontin he was prescribing, Virey said, “I cannot answer that." In a separate phone conversation Virey said that he drug tests each patient and examines them thoroughly. “Once I see the patient is addicted, I refer them for detoxification, like rehab,” Virey said. Virey added that he takes Oxycontin himself, to help cope with pain associated with severe bleeding ulcers. City Councilwoman Annabel Palma said her office has fielded more than 200 calls from people complaining that drug dealers and abusers loiter outside Virey’s clinic. "I started coming out and noticing all the activity that was going on, and then that's when I was convinced it was a pill mill," Palma said. "As a physician, he should be mindful of the oath that he took, and his practices don't coincide with that oath." Several people who were going in and out of the clinic threatened the I-Team with violence during the course of reporting this story. The I-Team has learned that NYPD officers have been called to the Westchester Avenue clinic about 40 times since January 2011. Calls ranged from medical assists to illegal street narcotics sales as well as larceny and burglary, according to sources. Experts in pain management say doctors should take several steps to ensure patients are not abusing or illegally re-selling prescription narcotics. The precautions include drug-testing patients before and after prescribing opioids, performing physical examinations to verify injuries, requiring MRIs, referring patients to physical therapy, and requiring patients to sign so called “narcotics contracts,” which forbid doctor shopping. Dr. Andrew Kaufman, a pain management expert at University Hospital in Newark, New Jersey, said physicians who don’t take those precautions are acting unethically, and possibly illegally. This article is the second in a series. Read the first.